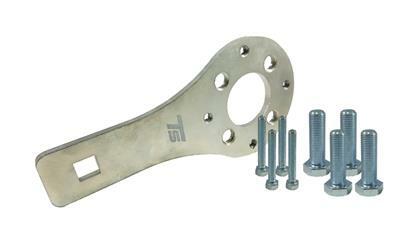 Torque Solution Crank Pulley Tool for Subaru EJ & FA motors. We designed our tool to be compact and easily fit in any mechanics or DIYer’s tool box. Works with any 1/2” drive ratchet or breaker bar. Precision laser cut from high strength steel and then Zinc coated for durability to last for years in your tool box. Hardware is included for crank pulley removal for 2 different Subaru Crank pulleys making timing jobs faster, simpler & safer. Interchangeable with factory tool part #’s 499977100, 499977300 and 499977400.